A spiritual Partzuf is a manifestation of one’s attitude (or desire) that is focused on one’s neighbor. “The neighbor” is either somebody that one senses inside himself after he corrects his attitude or it is the Creator Himself. A Partzuf reflects the degree of one’s bestowal and its “shape.” All Partzufim (Aba, Ima, YESHSUT, Tvuna, Zeir Anpin, Nukva, Atik, Arich Anpin) denote various forms of relationships and different systems of connection. A Partzuf is a system of connections between the Creator and creation. The Creator is called Keter and creation Malchut. 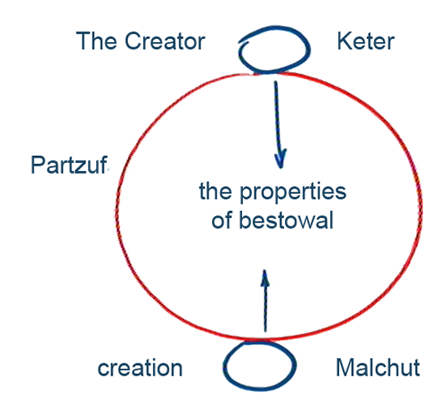 The rest of the Sefirot stand for the properties of bestowal that come from the Creator; creation’s task is to acquire (copy) these properties. A special form of connection that is imprinted in a snapshot is called a Partzuf. It’s a unique type of relationship between the giving force and the recipient, meaning either between two people, or between a person and the Creator. Out of His general desire to give, the Creator transfers to us eight effects: Hochma, Bina, Hesed, Gevura, Tifferet, Netzah, Hod, and Yesod. Our personal properties and the desire to receive allow us to perceive His bestowal at the level of the last Sefira (Yesod), which is the place of assembly of all bestowing qualities; after we attain it, we act accordingly. We sense ourselves and our desires to receive pleasure as pleasant or unpleasant. If we feel bad, it means that the entire system acts in a way that doesn’t allow us to trace who particularly is responsible for our pain. It seems to us that all our sufferings are the fault of others, and suddenly, we discover the entire world around us. If one begins correcting oneself by making an effort to justify the Creator, or one tries to love his neighbor, and by doing so attains the Creator (meaning one sets the right relationships with the external world), then one discovers that everything is pre-arranged solely for his own benefit. One begins changing oneself so that at every given moment of his life he can regard everybody as wonderful, kind, and positive. For that, one needs to constantly change oneself; it will eventually correct him. If we want to see the world as a perfect place, we have to perpetually change ourselves and correct our egoism to be adequate for a new perception of the world. It’s called “loving one’s friends”: We continually strive to maintain harmonious, loving and caring relationships with others, which will eventually lead us to the Creator. This mechanism constantly changes us. One continually keeps altering internally, but at the same time, one should retain a vision of his friends as great. If he manages to act so, one certainly self-corrects. This is the way one works on the structure, on his Partzuf, which connects him with the Creator. It’s not perfect as of yet, so one doesn’t sense a reciprocal connection within this structure as between two people who are in love with each other: “I am for my beloved, and He strives to be with me.” However, one has to grow up into this condition. Everything is right in front of us; there’s no doubt that it’s oriented directly to the Creator. It happens automatically, since He is behind it all. One can be totally confident of this fact; there is no need to check it out. Of course, one has to maintain the right intention towards the Creator, since the final action is already included in the initial thought, so we have to direct ourselves toward the Creator in the first place. However, we have at our disposal a wonderful tool for measuring that clearly demonstrates to us what we are supposed to do in our current state.